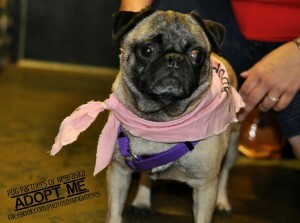 Meg - Available for Adoption! Meg came in pretty scared of everything but she is so ready to live the good life. Meg is in foster care and we should hear from the foster home shortly. Meg’s name is Sprinkles now. Sprinkles loves her sister “Skippi” and they play together in our apartments courtyard all the time. She has also been spending time at Good Karma Day care, where the staff work very closely with the pups and Sprinkles loves it. She is actually with the “cool group” of little dogs that chill behind the desk all morning with the staff! Sprinkles vision is coming back & her vet is watching her closely. She is a doll and we love her so much. Thank you PP!